After the disappointing performance of the Keene DCHUB, I was curious to know if the T-Rex Fuel Tank line of products would fare any better. 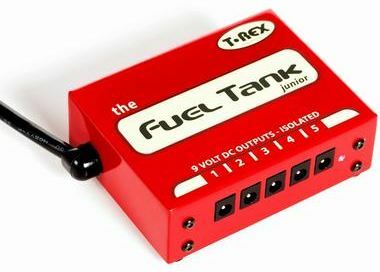 The Fuel Tank is a multi-DC power supply designed for musicians to power multiple guitar pedals. Being designed for musicians it is, of course, engineered to eliminate any kind of interference or ground loop hum. Unfortunately for us, although the voltage and even the polarity is exactly what we need, the unit simply doesn’t output enough amps to power even the modest requirements of a Megadrive or Super Nintendo. A real shame, as the actual unit seems of excellent build quality and would have reduced cable clutter significantly!